What ViX Image build number are you using? Have you tried a flash WITHOUT settings restore? Have you tried this? PLEASE SELECT YES OR NO. Have you tried a flash WITH settings restore? South of the Watford Gap! Just noticed that the name of recordings are being truncated. Any ideas how/why/when? I'm pretty sure that has been caused by a bug fix by Simon Capewell. The duration in the middle of screen wasn't there before (please correct me if I'm wrong). This has taken up some space. Oh right, I never really noticed the addition of the duration. Just checked the menu options and it doesn’t look like the duration can be disabled. What bug? 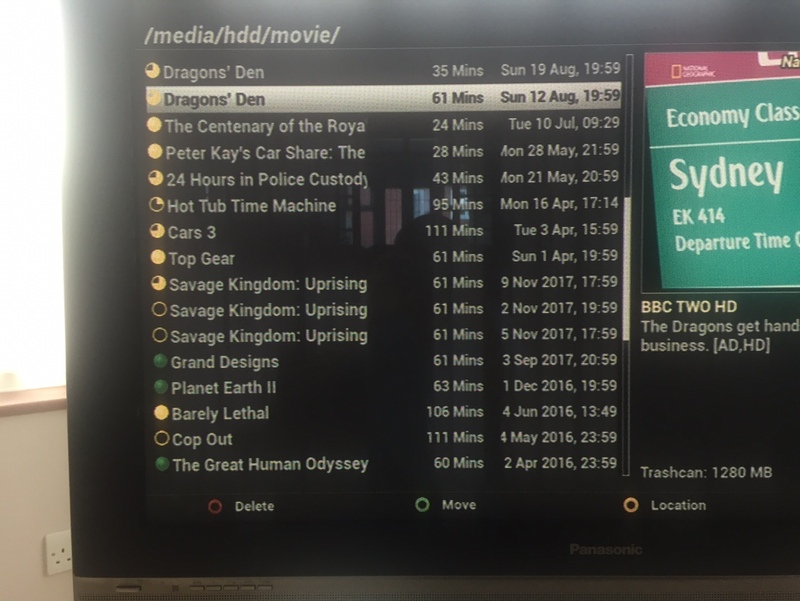 The correct duration information was already there on the right hand side of the screen (just above the content description) when highlighting the program! It's now reported twice! It can, but the option is in the wrong menu (I'm hoping to change this...). Instead of being in the Settings for a Movie Selection list it's in the Recording & playback system menu. Well, no. It's reported for every recording in the list, but only the current one on the R/h side. It was added when sort-by-duration was added. Looks worse when browsing the contents of my NAS as the duration for all content is blank so a massive gap between the truncated name and the date. Using Birdmans suggestion above I’ve disabled the length option and all looks well.